There are so many reasons people decide to become, notary publics. There are plenty of job options where being a notary is a great fit, like law offices, banks, and title companies where they have notary publics on staff. Becoming a notary is an excellent way to be able to work from home. Also, notary publics enjoy a stable job because of no matter the economy, there is always a need for documents to be notarized. Some official documents require an official person to witness signatures to prevent fraud. A notary public is selected by the state they reside or work in to serve as a third-party, impartial witness over the signing of important papers. Notaries also need to note whether or not those who are signing the document are doing so of their own free will or if they are under some sort of duress. Documents officiated by Notary Publics are usually having to do with estates, deeds, power of attorney, and other business-related papers. There are over 4.4 million notary publics in the United States. Some of them become notaries because it’s part of their job requirements, while others become notary publics in the context of a resume enhancer. Others become notaries to start their own traveling notary business. The main job duty of a notary is to act as an official of their state and make sure documents are properly executed. However, each state has its own set of laws for notaries to follow. Not all states require notaries to have formal training, and each state has their own set of requirements. In fact, only 12 states in the US require any type of training for notaries and they are California, Colorado, Florida, Missouri, Montana, Nevada, North Carolina, Oregon, and Pennsylvania. The other states urge potential notary publics to find training on their own. You can check your local secretary of state office, they may offer training or they can refer you to somewhere you can get proper notary training. To become a notary, you must be 18 years old, be a legal resident of your state, and have no criminal record. In some states, you must be completely fluent in English for both reading and writing. Some states, like California, have stricter policies for their notaries such as fingerprinting and carrying a passport type of identification. There are quite a few training programs for notaries available, both online and brick and mortar locations. You can find more programs through your Secretary of State websites, as well as a quick search on your favorite search engine. Training courses last between three to six hours, and the cost varies from under $100-$200 total, depending on the provider. One important online source is The National Notary Association. The NNA allows you to pick your state from a drop-down bar and apply to take the course or renew your license. It also gives you a complete checklist of necessities that comply with your state’s requirements for their notary publics. The American Society of Notaries has been around since 1965 and has helped train many Notary Publics through their resources. The ASN offers training programs in California, Florida, Missouri, Oregon, and Pennsylvania. They offer both web-based and in-person courses. Becoming a notary can take a couple of weeks or up to six months, depending on the state you’re applying to be a notary in. Fill all the necessary paperwork with your state’s Notary regulating official which may be your Secretary of State or county recorder. 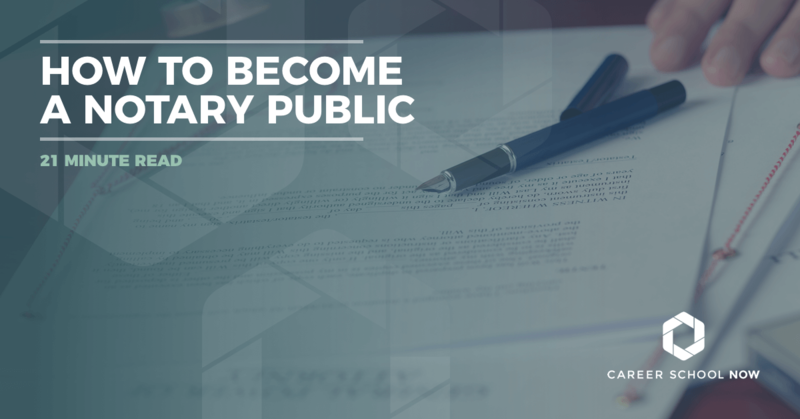 WHAT KIND OF LICENSE OR CERTIFICATION DOES A NOTARY PUBLIC NEED? Most of the United States does not have a certification requirement when it comes to Notary Public. However, 12 states do. If you live or plan on working in California, Colorado, Connecticut, New York, North Carolina, Ohio, Oregon, or Utah, you’ll need to sit for, and pass, an exam that will allow you to perform Notary Public duties. If you have to sit for a Notary exam, expect it to take approximately one hour to complete. It may include fingerprinting upon the exams completion. Once you are a notary, you are able to perform notary duties throughout your state. Few states have jurisdiction rules stating boundaries of where you’ll legally be able to notarize. Mostly, you just aren’t able to cross state borders when it comes to notarizing legally. Also, your duties as a notary extend to anyone who solicits you with a legal request for notarization. In most states, Notary terms last approximately four years before you’ll need to renew your standing. not have had a notary commission revoked due to failure to obey the law or failure to maintain residency within 10 years from the date applying. have had their civil rights restored in convicted of a felony and not have been convicted of a crime involving dishonesty or moral turpitude. have had civil rights restored, if convicted of a felony. be a U.S. citizen or legal resident of the U.S.
be a U.S. citizen, U.S. national or permanent resident alien authorized to work in the U.S.
not have had a notary commission suspended or revoked within 10 years from the date applying. not have been disqualified from voting due to the conviction of a felony or have been adjudged mentally incompetent. not have been convicted of a felony or have had a professional license revoked. meet the requirements established by law for each commission sought. not be currently imprisoned in any state, county or federal correction facility. purchase and have possession of the most recent state-approved North Carolina Notary Manual. What Makes the Notarization Legal and Binding? Signing a document in front of an official notary sounds like it is a no-brainer. But, that isn’t the case. In fact, there are many steps that must be taken, by both the notary public and their client, to ensure the document is truly legal and binding. The signer must be standing in front of the notary public. Either the notary personally knows the signer or there is enough evidence produced to prove identification. The document signed by the notary must be in its original form. Copies of any type are not permitted as legal documents. The complete document is presented, in its entirety, before the notary. If any pages are missing, the document is not permissible. Dates on the document must be the same as, or before, the date of notarization. Post-dated documents are invalid. The language of the document must be notarial and show keywords such as ‘sworn’, ‘acknowledged’, or ‘affirmed’. These words prove, without a doubt, which act was required of the notary public. The notary public has deemed the signer to be there on his or her own free will, and no act of coercion has been met. The notary journal must be properly filled out. In some states, the journal is a requirement. But, in the states where isn’t, it is recommended that notaries keep their own journal to protect themselves and their customers. There is a proper verbal ‘ceremony’ which has been completed. This is the part of the notarization that may be the most important because, once the documents have been signed and witnessed, the verbal affirmation that the client understood what was just done, along with the fact is was a willing act, makes it known as the absolute truth. A notarial certificate, which records and states the events, is presented. Without a notarial certificate, the legitimacy of the notarization can be legally challenged. HOW MUCH CAN THEY CHARGE? Most states put a cap on what notary publics can charge for their service. Typically, notaries can charge between $2-$10 per page or $5-$10 for the notarial act. Notaries usually charge the highest fee allowed per their state. Notary publics can also charge a travel fee if they have to go to meet a client. Normally, these travel fees run between $50-$75 plus the additional cost of the actual notarizing. Some places, such as local libraries and credit unions offer free or discounted notary services. Also, some states are beginning to provide electronic notarizations, such as Arizona, Colorado, Kansas, Utah, Minnesota, and Pennsylvania. However, there aren’t regulations on the prices for electronic notarizations so they can vary wildly. Indeed.com states that the average notary public’s salary is $27,000 annually. Many people become notary publics as a side job to supplement their income. Many notaries state that they don’t make much money as an actual notary, they became one as part of their job requirement. Notaries work in legal offices, mortgage companies, banks, title companies, and that’s where they make their main salary. Notarizing is an additional service they are able to offer. HOW DO I MAKE EXTRA MONEY? As a notary, you can make extra money using your notary services through a variety of different means. Even though many notaries swear that it’s nearly impossible to make a living notarizing, others have turned it into a lucrative business. It’s all in your approach and desire. Shout it from the rooftops that you’re a notary. Use social media. Write a blog. Send out postcards. Do everything you can to announce your new notary business. Have promotional materials made beforehand. Pens with your name and number on them. Magnets. Rubber bracelets. T-shirts. You know, things people wear or use that will a) be a constant reminder to the person wearing or using and b) will also inform others around that person of your service. Network the heck out of it. There are so many networking events, you can make a career out of attending those things. Network After Work is one. Join your Chamber of Commerce, those are great networking resources, as well. Attend conferences such as the National Notary Association Conference. Wrap your car with your business logo and contact information. You’ll be a driving billboard for your own business at a relatively lower cost than traditional advertising on, say, an actual billboard.